Editor’s note: Baseball is back and Yahoo Sports is previewing all 30 teams over the next month. This year’s previews will focus on fantasy and reality, as our MLB news staff and our fantasy baseball crew come together to assess each team before opening day. Next up, the Houston Astros. The Houston Astros, now a season removed from a World Series win, have a window that’s wide open to re-capture baseball’s ultimate prize. The road coming out of the American League is tough — real tough — but at least the Astros don’t have another mega-power in their division like the Yankees and Red Sox do in the AL East. George Springer, Alex Bregman, Carlos Correa, and Jose Altuve continue to highlight their offense, while a newly re-signed Justin Verlander and Gerrit Cole form a formidable 1-2 punch atop the rotation. Everybody mentioned is a desirable pick, whether we’re talking about real baseball or fantasy baseball. After that, the Astros have plenty of upside to draft too, whether it’s free-agent addition Michael Brantley, a seemingly rejuvenated Wade Miley or the next wave of talented Astros prospects. 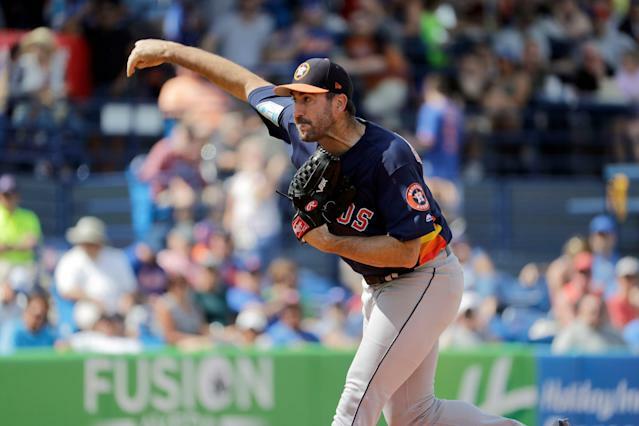 There’s no doubt, the Astros lost some key players to free agency, as Marwin Gonzalez, Charlie Morton and Brian McCann signed elsewhere, while Dallas Keuchel still remains on the open market. The Astros are hoping that their young core improves this year, that a healthy Carlos Correa closes any gaps and that a few of their new signees (Miley, Brantley) have significant upside. 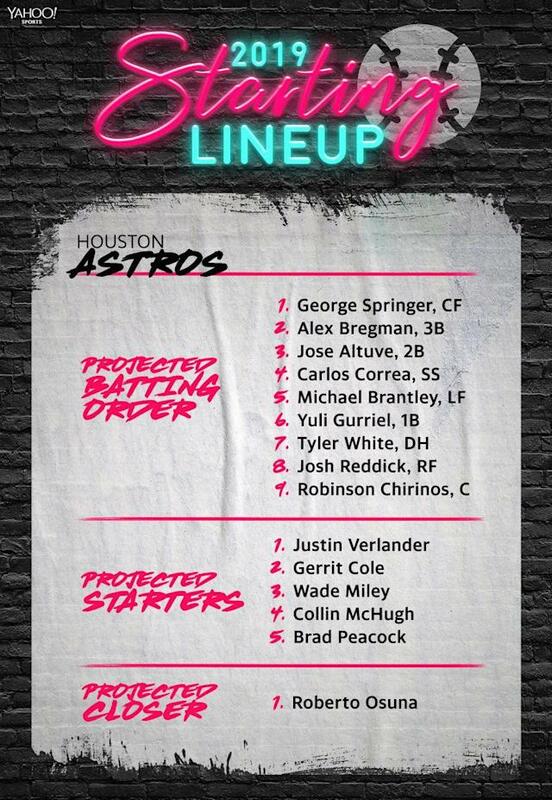 If Brantley is healthy and productive, he extends that lineup and if the Astros can work some of the spin-rate magic with Miley, they may not miss Keuchel or Morton. Who is Houston’s fantasy buy? Who is the Astros’ fantasy sleeper? Somehow, the Astros still have an embarrassment of riches in the minors. Pitcher Forrest Whitley is the most promising name. He enters 2019 as a consensus top-10 prospect in baseball and has ace potential. He’ll open the year in the minors, but is probably major-league ready now. He should be up soon. 1. Rotation replacements: Losing Dallas Keuchel and Charlie Morton to free agency and Lance McCullers Jr. to Tommy John surgery would devastate most teams. That's because most teams don't have anything close to Justin Verlander and Gerrit Cole to serve as rotation anchors. Wade Miley and Colin McHugh provide some veteran stability, but it feels like they'll need another pitcher or two to step up and give this rotation a needed boost. Our eyes will be on prospects Forrest Whitley or Josh James. 2. Carlos Correa returns to form: After an impressive start to his career, Correa took a noted step back in 2018, posting a disappointing .239/.323/.405 slashline. His back problems undoubtedly played a big role in those struggles. By the postseason, he admitted every swing caused him pain. The good news is he should be able to bounce back with improved health. The bad news is back ailments can be tricky to deal with. Getting Correa back to 100 percent will be crucial to the lineup. If this team had a walk-up song, what would it be? Houston rap godfathers UGK need to be the choice here — more specifically their fantastic song “International Players Anthem.” There’s no super obvious parallel to the Astros except Houston, but that’s enough.